Elements of this editorial could have been lifted directly from my work requirements as a U.S. Foreign Service officer over the decades. One of my overarching goals as ambassador to Panama was ensuring that the Panama Canal remains open to world commerce, so that ships can ply the oceans. I also devoted considerable time and country team energy to resolving the kidnapping of an American business executive in a way that made the prospect of holding another American citizen for ransom very unattractive. And, as a first-tour economic officer in Panama, I helped establish the rules to protect intellectual property and then saw the fruits of that effort—including Panamanian ownership of the resulting legal framework, which protected their intellectual property as well as ours—20 years later when I returned as ambassador. I suspect that many members of the Foreign Service can say the same thing—that, whatever your cone or specialty, your work on behalf of our country has established rules, removed obstacles and opened markets so American businesses can compete on a reasonably level playing field and thrive around the world. I was delighted to see the related cable that went out in early November to all diplomatic and consular posts—18 STATE 112364, “Boosting Commercial Diplomacy Around the World.” The ALDAC, which makes clear that Secretary Pompeo has made commercial diplomacy a foreign policy priority, provides practical tips to strengthen our ability as a country to support U.S. business interests (see excerpt here). 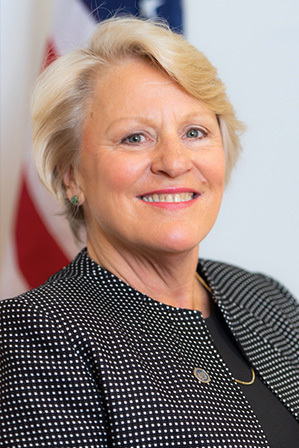 AFSA’s ongoing work with congressional champions stands directly on the shoulders of the work you, members of the Foreign Service, do all around the world. When members of Congress visit your post, I urge you to be prepared to tell them what you and your colleagues are doing to help American companies compete—and win. If you find, as I have so often found, that the soft power you have to work with comes in significant measure from the positive impression made by American companies—maybe because they are known for treating their workers fairly and promoting on merit, maybe because they inspire awe with their problem solving and project management—be sure to mention that to visiting CODELS as well. When American businesses thrive overseas, it not only means greater prosperity at home, it also often directly boosts American global leadership by reminding people abroad what they most admire about our country. We know how to get things done. As the Foreign Service seeks to rebuild in the wake of recent hiring freezes as well as a decade-long decline in funding for core diplomacy, we need vigorous support from Congress. With rising competition from China and other countries, we need that support urgently, to avoid ceding yet more ground. 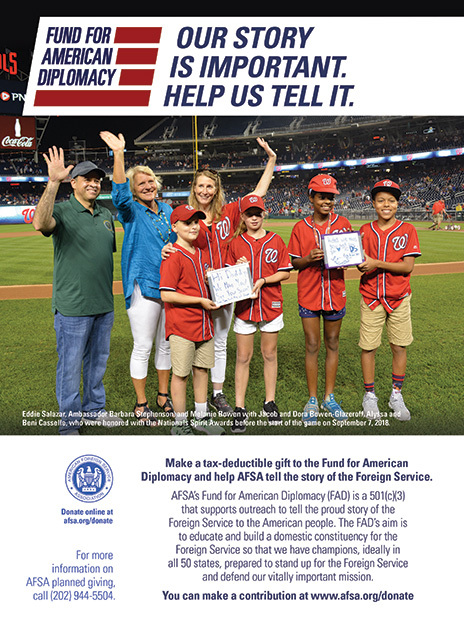 AFSA’s ongoing work with congressional champions stands directly on the shoulders of the work you, members of the Foreign Service, do all around the world. I encourage you to polish your own stories of success (or even failure, which can be equally instructive), so you can share them with members of Congress when they visit your post. 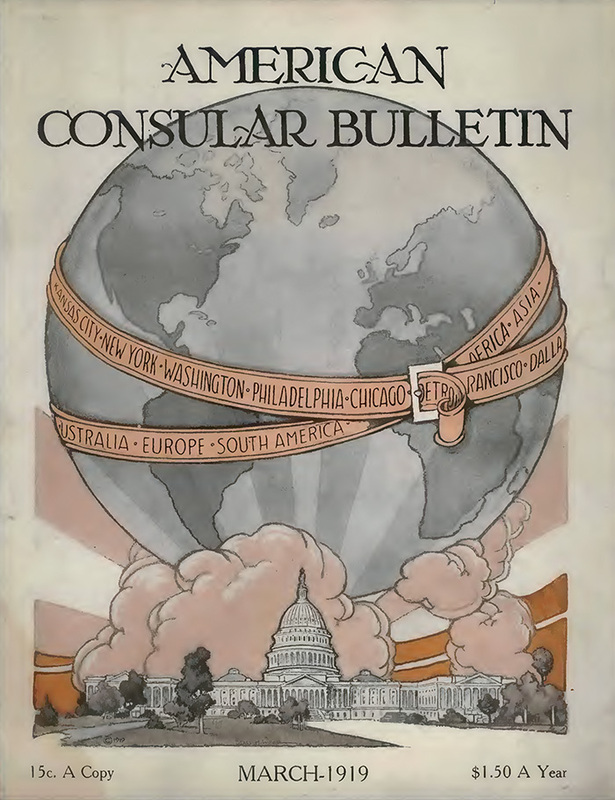 The first Foreign Service Journal. And please read the Economic Diplomacy Works stories in this collection for inspiration and practical tips on doing your own job better. If you are in Washington, please join us for the Economic Diplomacy Works panel AFSA is hosting with the U.S. Diplomacy Center at noon on Jan. 15. And watch AFSA’s daily media digest for links to “American Diplomat” podcasts on the theme of economic diplomacy. I share this as a reminder that this—Foreign Service support for American business—is not some new-fangled thing. Nor is it ancillary. It is foundational to our purpose. It is a major reason why the U.S. Foreign Service was created, why we exist. In my AFSA role as the “voice of the Foreign Service,” I have spent a fair bit of time on the road telling the proud story of the Foreign Service to Americans all over this great country of ours. One part of our story that I know resonates is what we do to increase prosperity at home. When I explained how the Foreign Service worked to open markets overseas for American-grown soy, the audience at Farm Fest in southern Minnesota immediately grasped that what we diplomats do matters to them. When I explained how the Foreign Service helped a local firm get a stunning glass sculpture into the lobby of a new luxury hotel in China, the audience at the San Francisco Commonwealth Club immediately saw how our global network of embassies delivers for local business—and they grasped also my further point that the resulting display of American design excellence boosts our country’s image with everyone who sees it. When we in the Foreign Service make this mission—helping American businesses compete and win—a priority, we help build a domestic constituency, and we shore up bipartisan support in Congress for an adequately funded Foreign Service. We also directly and concretely bolster America’s global leadership by refusing to cede the game—a game whose rules the United States wrote—to rivals and adversaries.